Did I forget to write about this? The word "forget" may be a little less passive aggressive than what I am really doing, which is procrastinating, because the whole thing got a lot more complicated than I expected it would. So you know that thing when you're pregnant? Where stuff drives you crazy? Like a crack on your wall that you've never seen before, a crack that is gathering dust and gecko poo, and you see it for a few days and seeing it makes you itchy? So one day you decide to clean the crack, but you only make it worse, and then you find yourself on your hands and knees cleaning more cracks and making them worse? The dust in the corners. A tile that's out of place. Irritating things become magnified in pregnancy, until instead of being something minor, it's all you can THINK about. And people try to talk to you, but you can't focus because WHAT WAS THE TILER THINKING? Two blue and one white, that's the pattern, why are there three blue tiles and one white tile all willy nilly over there in the corner of the bathroom? Do you remember? Or can you imagine, if you've never had this particular mental illness? Well, that's what Leafy's hair was doing to me, all through this pregnancy. The kid has a LOT of hair. YaYa's hair never hung in her face the way Leafy's does. It nicely parted and hung on the sides of her face, like well trained curtains that aren't trying to take over your life. But Leafy's was like a sheaf, just a blanket of hair in front of his face, and he never noticed, and nothing I did could convince him to take notice. Somehow I became paranoid that I was losing him because of his hair. His hair was trying to take over our lives. It was trying to come between us. I even possibly believed that it was part of the reason for the bad attitude that has possessed my sweet boy's body and mouth from time to time recently. I started to say things to him, little bitter things like, "Leafy, if you can't keep your hair out of your face, I'm going to have to cut it off." We came up with a deal that I could tie it back from time to time, in a ponytail, just to have a hair-in-face free day. Because the other thing about Leafy is that he's incredibly picky about the way he looks. Put a bandana in, and he'll rip it out, declaring that he looks stupid. It's the same with any other thing I've bought to try to hold his hair back. But here's a word of advice: If something is driving you crazy while you're pregnant, go ahead and fix it! Use some of that nesting energy to wash the car, rearrange the furniture, sew the curtains, buy a better dishrack. But if it involves the physical appearance of anyone in your family, LEAVE IT ALONE. I didn't make Leafy cut his hair. But I blame myself for putting the idea in his head. 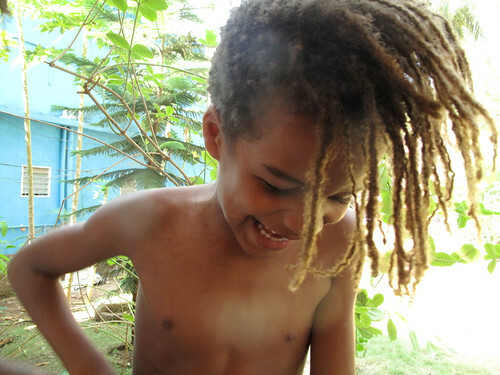 When we were in Goa, he started to say he wanted hair like Kid A's. He's said stuff like this in the past and we always said, "Wait a few days, or a couple of weeks, and see if you still feel the same way." And he waited, and decided, "No, I will never no never cut my hair." My dear Superstar Husband thought that he would try just a little dreadlock mohawk to start out, just for fun. Then the idea was that we would cut the rest of his hair off, maybe leaving a short mohawk. We all gathered on the porch and exclaimed with glee over the fun of dreadlocks falling on the floor. I exclaimed over his head! His beautiful head, hidden under miles of hair for so long. Anyway, it was fun and it was fun, but then it wasn't, because about thirty minutes after his hair was mostly gone, Leafy decided that he wanted it back. And that isn't possible! So he cried and cried. He cried for hours. And oh, how I wanted to give it back to him. 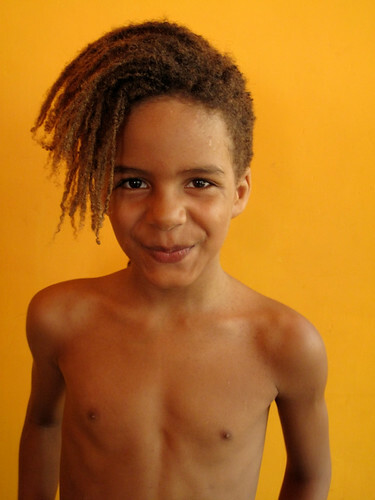 We've never made a big deal about dreadlocks, the kids just have them. There is no special reason except that we like them and they like them. (Just like there's no special reason that Kid A doesn't have them. He never has, and he doesn't want them, that's all.) 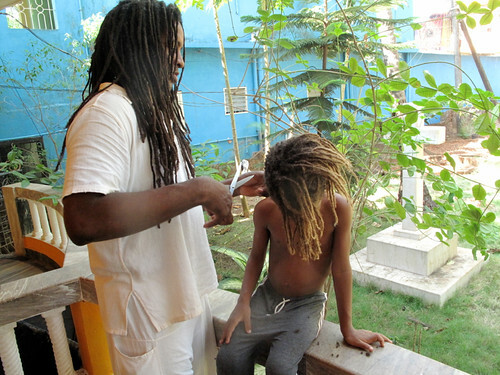 But in the world of dreads there is this thing called dreadlock regret, because it's a type of hair with a certain commitment and longevity to it. 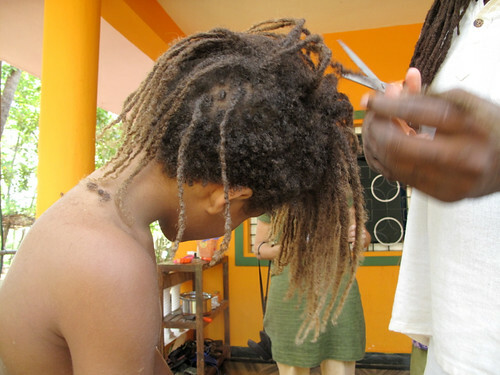 Everyone regrets cutting their dreadlocks off for a while after they do. And our six-year-old had it bad. And so did I. What was I thinking? They were adorable. And in between all my reassurances of "It's only hair, and it will grow back, and Daddy's on his third set," I gnawed at my hands and cursed my wayward pregnancy ranting about hair in the eyes. So the mohawk remains. Because Leafy insists that he wants to grow out his hair underneath the dreadlocks that are left. I am keeping my mouth shut, even though he also insists on parting it so that it looks like a really thin dreadlock hairstyle with the bottom shaved like everyone did in the early nineties, my least favorite era. And Chinua is completely disgusted with the both of us and says he'll never listen to either of us about hair ever again.